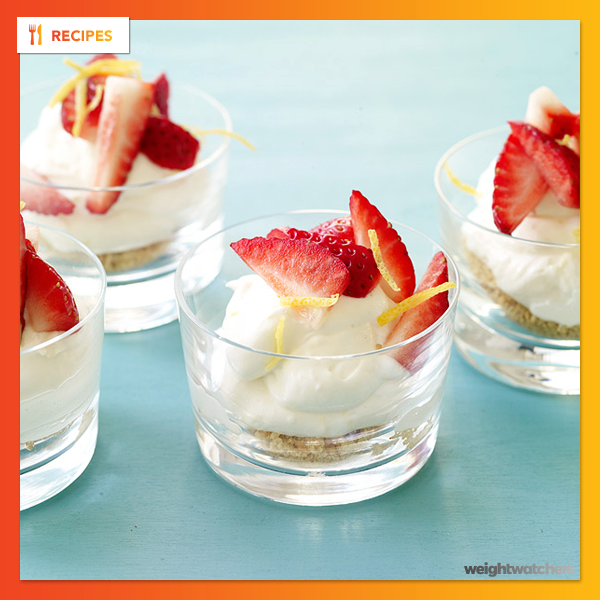 In a large bowl, beat together cream cheese, yogurt, powdered sugar, milk, lemon juice and lemon zest; fold in whipped topping until just combined. Place butter in a small microwave-safe bowl; microwave until melted. Add graham cracker crumbs and salt; gently mix to combine. Line up sixteen 2-oz shot glasses on a work surface; layer each one with 1 tablespoon crumb mixture, a heaping 3 tablespoons cheese mixture and 1 quartered strawberry. Serve or refrigerate until ready to use. Yields 1 per serving.